In Clarksville, the utilities commission makes the decisions relating to utility infrastructure investments. The commission members in Clarksville have all served for a number of years, understand the business aspects of managing the utilities, and “get it,” says Lester. CLW needed a SCADA system to improve utility efficiencies and, once they decided to invest in the system, they felt it only made sense to investigate the possibility of fiber for additional purposes. CLW commissioned a consultant for a feasibility study, who determined that an investment in fiber for the utilities was affordable for CLW. They followed up with another study to determine hard numbers; the second study obtained the same results. In the fall of 2015, the utility commission authorized approximately $1 million to build the fiber network. CLW was able to use capital on hand; they have not needed to bond or borrow for the network project. CLW installed 288-strand fiber to ensure ample capacity now and in the future. At that time, Ritter Communications, was deploying their own infrastructure in the Clarksville area to expand its regional telecommunications network. CLW hired the same construction company Ritter was using when it offered a favorable bid to build the Clarksville project. In December of 2015, they commenced the project to deploy 16+ miles of aerial fiber on the CLW poles and finished construction at the end of March. The design uses a three-ring configuration to ensure redundancy. Next, the Clarksville utility commission authorized approximately $400,000 worth of SCADA electronics; the system was operational by the end of June 2016. In July, the water, wastewater, and electric utilities began using the fiber for business operations. Next, Clarksville began exploring how to best use the network to bring better connectivity to the entire community. City leaders have decided to dedicate a percentage of the extra capacity for specific needs in the community, including local community anchor institutions (CAIs). Clarksville will carve out 12 strands each for educational facilities, healthcare institutions, public safety needs, and government facilities. The utility will use 48 strands for its own needs, which will leave more than 200 strands available for future use. The plan to connect Clarksville schools is already set: the Clarksville Public Schools will begin taking services on July 1st. The district will have two dedicated strands and will connect eight of its facilities directly to the ring; the wide area network (WAN) between the facilities and along the ring will allow 10 Gigabit per second (Gbps) capacity between facilities. The school district will also have access to the CLW network operations center so they can install back up servers. In order to allow students without home Internet access the opportunity to connect beyond school hours, the utilities commission and the school district are considering installing fixed wireless hotspots at locations along the fiber ring. Students would be able to complete homework via the school network. The Clarksville Public Schools is the first district in Arkansas to issue laptops and tablets to each student and needs high-quality Internet access to support their tech initiative. CLW will charge the public school district $43,000 per year for more reliable connectivity that it currently receives from Suddenlink, which charges the district $72,000 per year. Clarksville schools will use E-rate, a federal program to reimburse schools for connectivity costs, to pay for the services. The Johnson County Regional Medical Center was already connected to the network with dark fiber, even though it isn’t one of CLW’s customers. CLW leased the dark fiber to Ritter so the company could provide Internet access and other data services to the hospital. CLW provided the service to Ritter for $1 per year in exchange for very low bandwidth rates. Lester says the mutually agreeable arrangement will continue. CLW is building infrastructure to other city offices and the network serves ten utility facilities. There are also a few locations where the fiber network supports fixed wireless CLW locations where connecting with fiber isn’t cost effective or practical. Johnson County Government is interested in using the network to facilitate video arraignments so individuals don’t have to be physically moved from the detention center to the County Courthouse several miles away. Sandy, Oregon, uses its FTTH network for the same purpose to eliminate the risk and expense of moving individuals for short arraignments with the court. Local businesses are also interested in taking advantage of the new publicly owned infrastructure. Lester is already taking inquiries about how and when they can connect to the city’s network. A statewide bank with three branches in Clarksville wants to use the CLW fiber and contract with Ritter for Internet access. Lester finds that some of the larger businesses, often those with national headquarters that negotiate Internet service agreements, are committed to incumbents for multi-year contracts. If they don’t want to scrap those contracts, CLW can provide connectivity by offering better and more affordable connectivity on the CLW fiber. In Arkansas, municipalities may only offer telecommunications services to the general public only if the community operates an electric utility. There are 14 communities in the state that own and operate electric utilities, but only two - Paragould and Conway - that offer telecommunications services to the community. Local municipalities are not allowed to offer telephone services. CLW seeks creative solutions for connectivity and advancing broadband adoption throughout the community including anchor institutions, business and commercial entities, and eventually residential customers with the ultimate objective being economic growth and local sustainability. Service providers are asked to respond with their qualifications, level of interest, technical capabilities, potential service/product offerings, and information regarding their overall interest in joining CLW in a public-private partnership. This partnership could be either in a retail or wholesale fashion and designed to be delivered over ultra-high speed communications over a fiber optic network CLW owns. They received six responses and are in the process of limiting the field to two or three potential partners. Responses ranged from companies that want to offer Fiber-to-the-Home (FTTH) Internet access to the local community to a wireless provider and even a company that hopes to offer voice services via the fiber network. As CLW interviews and digs deeper into the possibilities, they are well poised to work out a deal with any potential partners because they have control over the infrastructure they own. While CLW examines the RFQ responses, students at the Clarksville Public Schools have already participated in a campaign to name their network. Students chose from several possible names for the network and decided on clarksvilleconnected.net as the name of the new publicly owned fiber network. 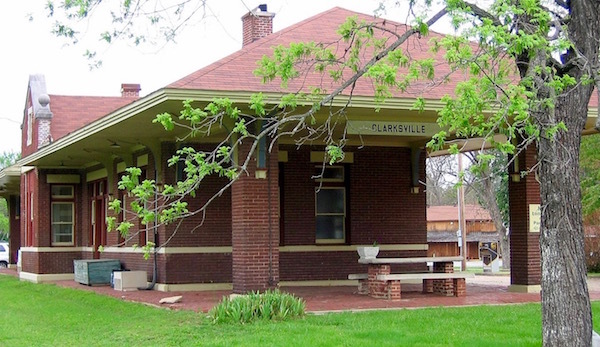 Photo of the Old Train station at Clarksville by Ron Reiring CC BY 2.0, via Wikimedia Commons.